Our Balladeer model Hurdy-Gurdy is based on a still extant late15th century instrument owned by a German friend. The original was found in Lithuania shortly after world war two. 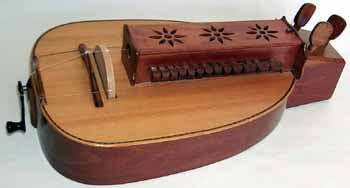 It is a robust "Bauern Leier" (peasant hurdy-gurdy) with three strings, diatonic key-board and large sounding board, producing a rich, full sound when strung for -G- or -A- tunings. The sounding board is Sitka spruce, the body can be cherry, walnut, or maple-wood.The tangents are fully programmable, allowing each one to be focused up to a semitone higher or lower, as needed for playing in different modes. Two small containers for powdered rosin and a small ball of cotton are built into the inside of the keyboard box. Check out the Media Gallery for a video clip of George Kelischek playing the Hurdy-Gurdy!